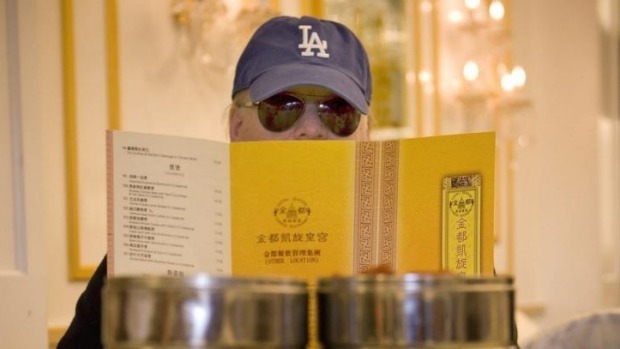 Jonathan Gold, Man Most Likely, is armed with a pocketful of "the only restaurant critic tos…". He's the only restaurant critic to win a Pulitzer Prize. He's also the only restaurant critic to have ever been given a nickname by Snoop Dogg and Dr Dre (it's "Nervous Cuz"). Once upon a time, he was the only restaurant critic to apply the same weight to street level snacking as to the city's fine diners. 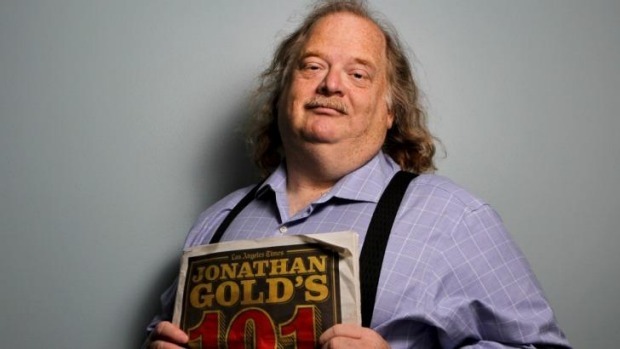 Up until a few years ago, it was impossible to find an image of Jonathan Gold in which he wasn't wearing a beekeeping suit, or lizard mask. He'd be snapped hiding behind menus, novelty-sized glasses and old tortillas. Nowadays he's everywhere, and hard to miss with his shock of long ginger hair. He looks like a restaurant-loving warlock, and a man who knows how to have fun. The LA Times critic has been credited for pioneering a whole new style of food writing. One where mess, funk, heat, flavour and fun might be served on Laminex or linen. Where the quest for the perfect doughnut, fish maw curry or xiao long bao carry the same heft as the hottest restaurant in Koreatown or Silver Lake. When he first hit the scene in the 80s, it was a time when the best taqueria in town was the one that was convenient to home for the city's main restaurant critic. "Nobody would eat at the Thai restaurants the Thai people ate at," he says. "Mexican food may as well have not existed for all it made it on to the radar. But now, I think people know that sometimes the most important tool in your kitchen is your car." The J-Gold goes low to get high, and he's made a very successful career out of it. He's a ghetto junkie, and a spice fiend. "If you get the heat up to a certain level," he says, "you get the flavours to balance. There's a difference in the sweetness and funkiness in the dish. It's almost like putting on 3D glasses. The downside is you can only eat two spoonfuls before you die, but they're an amazing two spoonfuls". And he's nothing if not consummate. "I remember once going to Paris and having this guide and somehow thinking it was amusing to see the top 30 things in 24 hours. It's impossible to do. I almost killed my girlfriend. We were just starting to go out and I was thinking 'how am I going to tell her mother I killed her?'" Jonathan Gold, the man, the myth, has been rocking around LA for a quarter century writing about food in a light, irreverent and totally elegant style that's been emulated by many, but nailed by very few. In a past life, he was – and remains – a well-respected punk and hip hop journalist (currently on a Kendrick Lamar kick, Gold calls him "the sensitive poet of gangster rap. You still have to keep your AK47 oiled, but you can be introspective about the experience"). He once played cello in a punk band. Get the latest news and updates emailed straight to your inbox. The beauty of LA is that you can do all that and then completely change tack and write about food instead. His spiritual home never ceases to blow his mind. "In certain ways I think LA and Sydney are not as dissimilar as you might think. They're both centres of immigration, they're both vast and spread out, they have very similar qualities of light. LA is in a lot of ways the place where the world dreams. Where people go in order to find their best selves, whatever their best selves might be." Los Angeles is the new Brooklyn, in case you missed the news, home to milliners, artisanal jam makers and champion baristas, YA novelists and successful banjo players, and any number of folks inclined to use "brand" as a verb. An artisanal thing, the bartender's equivalent of the ambitious jams and preserves flooding Etsy at the moment. Smells like a bad day at the morgue, but tastes like what God probably had in mind when she came up with lima beans. I love mini-malls. I love swap meets. I love tamale carts. I love itinerant fruit vendors. I love old Guatemalan women with hampers full of corn on the cob and squirt-bottle mayonnaise. I love entry-level capitalism at its most chaotic, where the barriers to doing business are on the wispy side of minimal, where a family with a dream and a catering license can support itself selling delicious barbecued cabeza from a truck window. Jonathan Gold is in Australia for Good Food Month, and appearing at events in Sydney and Melbourne. Join us for a very special event with some of the brightest minds in the food biz. "How I Eat" will be a conversation about eaters and eating between Chris Ying (editor-in-chief, Lucky Peach), Jonathan Gold (LA Times critic and Pulitzer Prize winner) and Terry Durack (SMH chief critic) moderated by Myffy Rigby (Good Food Guide editor, Good Food Month creative director). Afterwards, we will host the Sydney premiere screening of Jonathan Gold's documentary, City of Gold. $35 general admission. The Sydney Morning Herald Good Food Month presented by Citi runs October 1-31, sydney.goodfoodmonth.com. If you like Q and A and eating, this is the event for you. Join Chris Ying, editor-in-chief of Lucky Peach magazine, Pulitzer prize-winning food writer Jonathan Gold and top Australian chef Ben Shewry, owner of Attica, as they hash out the big questions of the food world, like 'is the internet ruining restaurants?" and "what's does a taco of the future taste like?' BYO questions, we'll bring the beers.